On the day of Basant Panchami, I reached Virbhadra near Rishikesh in Mussorie to join my first service in one of the largest Pharmaceutical Company of India. Luckily I could accommodate myself in one of my friend's apartment in Mussorie . In the evening my friend asked me to join him on the rooftop of his apartment to enjoy the views of mountains surrounded by Mussorie. While he was enthusiastically showing me the hills and their habitats with illuminated houses, I looked at a distant mountain covered with snow and enquired the name of that place. Mussoorie came to the answer and I felt so pleased that I thanked God for sending me to a place about which I read in the books till recently. I was waiting eagerly for a chance to visit Mussoorie then onwards. The chance materialized after some time in the month of December around Christmas. Seeing my interest for the place, one day my friend arranged for a weekend trip and some of my other friends Dilip, Sandhya, Pronoti, and Sarkar joined me and we find best tourist places to visit in mussoorie . In the morning we hired a cab to reach Mussoorie via Rishikesh – Dehradun – Raipur. It was a two hours journey. By the time we reached there snow had started falling on us. Since the cab would not go after a certain distance we started walking on foot. The road was very slippery and we started feeling snow bite below our feet. However, since we had no choice we walked up to our hotel on the hilltop. The Hotel was practically empty hence we could accommodate ourselves at a very concessional rate. After having breakfast we planned top places to visit in Mussoorie and started our sightseeing of some of the selected places. 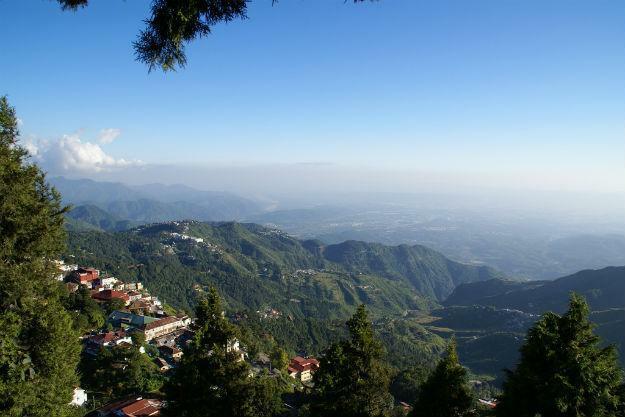 Mussoorie, the Queen of Hills is named after the plants Mansur ( a variety of shrubs ) that are grown here. It is one of the best hill stations of India situated in Dehradun district of Uttarakhand. Mussoorie was founded by Lt. Frederick Young ( Born 30 November 1786 at Green Castle, Moville, Ireland, )It's abundance of majestic hills, flora and fauns with lush greenery, a perfect soothing climate and breathtaking view of nature attracted this British citizen so much so that he decided to stay here forever. built in 1838 ,a beautiful bungalow flanked by dense forests with great variety of flora and fauna turned into a hotel and became major tourist attraction of Mussoorie. We were spellbound seeing the snow capped Himalayas and the sky-blue river Yamuna from here. stretches from Picture Palace at its eastern end to the Public Library at its western end. In one of the bookshops here we located the famous novel writer Ruskin Bond. A book autographed by him was presented to us. Indians are Not Allowed". Racist signs of this type used to be commonplace here founded by' the British. Motilal Nehru, father of Jawaharlal Nehru, used to violate this rule every day during his visits to Mussoorie and paid fine without any hesitations. , one of the main attractions of Mussoorie, situated at an altitude of 4,500 ft, on way between Dehradun-Mussorie road is is a beautiful waterfall, which falls from a height of about 40 ft from a mountain. This place was developed by Lord Mekinan in 1835 as a tourist spot. Its name is derived from Camp-Tea. , the Britishers during their Raj used to organized team parties near this falls. A pond under the falls used by many tourists for bathing. 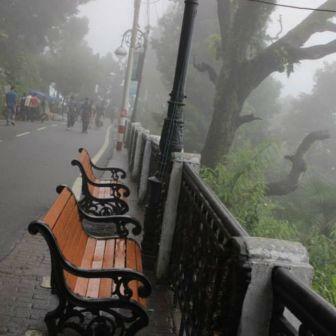 Best time of the year to visit Mussoorie is September to May. In rainy seasons people avoid this place because of torrential rain and landslides. Mussoorie has some of the best luxury and budget hotels. The can be booked on line with the help of trip-advisor or make-my-trip. Distance from Delhi is about 290 km with 6 hours journey. Air and Train services are available upto Dehradun. Cabs are available at reasonable prices. After concluding our journey we returned to our hotel in the evening and started for our home at Virbhadra, Rishikesh. It was a memorable journey and all of us felt like staying for a few more days but since we had to join our work on Monday we could not prolong our stay beyond the scheduled departure. I had visited Mussoorie thrice in my life. And whenever I visit here, it gives me enchanting experience every-time. The weather here remains pleasant most of the times. Being flooded with tourists especially during peak seasons, I used to visit here at off seasons only. 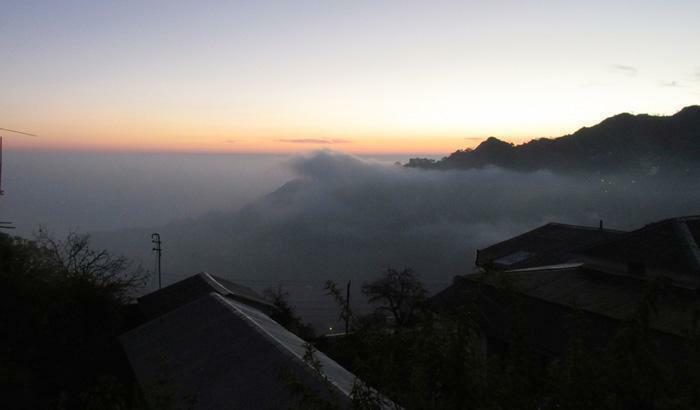 Ahead of Mussoorie, you can visit Dhanaulti as well. Thank you for such an informative article. I've always wanted to visit hill stations like Mussoorie. Could anyone tell me what is the best time of year to visit Mussoorie? Mussoorie is a nice place to visit. I went mussoorie last year. I visited so many places. I like kempty fall very much. I stayed at Welcomheritage Kasmanda palace. It’s a nice place to stay. I enjoyed my stay there. It’s nice to spend your holidays at such a nice place. Nice and informative article on Wayanad, one of the exotic but lesser-known destination in Kerala. During summer vacation I visited Mussoorie. I stayed at WH property Kasmanda palace. It’s a nice place to stay and enjoyed my whole trip fully. Especially I liked hospitality of WH palace. Excellent post – so many great tips! Thanks for sharing this informative blog. It is very interesting and great article. Mussoorie such a beautiful place. I really like your post.